Comedy actress Tami Stone presents her debut one-woman Edinburgh show. A pick'n'mix of sharply observed oddball characters. Chasing fame, finding love... modelling with fruit. It's all here! My Funny Bits is written by Andrew Ludlam, whose work has previously been performed at the Edinburgh festival, Brighton Comedy Festival, Soho Theatre, London and Birmingham Monologue Slam. 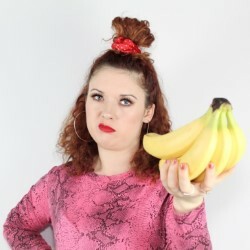 Come and gawp at Tami's funny bits... a fast-paced comedy collective including a ditsy wannabe actress, flirty holiday rep and Kent's loudest motivational coach.